Hey! 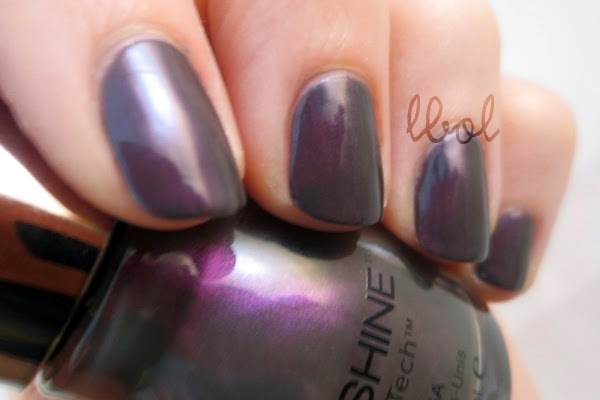 It's that polish swatch I was telling you about yesterday! I keep typing "Who's the Glodd". It's happened like forty six times. Who is the Glodd? 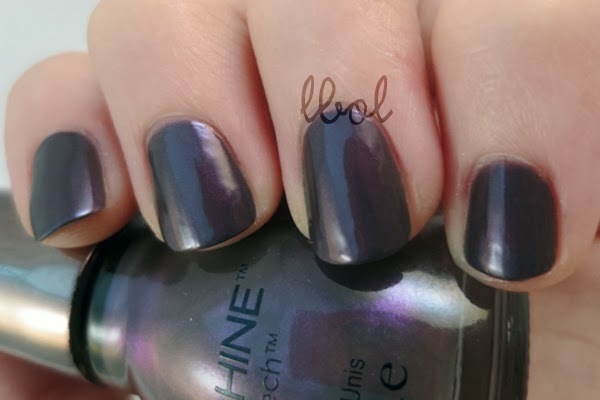 Who's the GLOSS is, you know, it's a member of the fancy Sinful Shine branch of the Sinful Colors family, with its metallic cap and Gel Tech. Ooooooh boyyyyy. Applied much nicer than Zeusy-poo, but still didn't smooth out as much as I would want a polish that's supposed to be not so much requiring a topcoat to do that job to. I don't even know what I just typed there. But do you get what I mean, kinda? Anyway, so. It's, like, dark gray sort of, but like, barely plum-toned... and the shimmer is violet and still a little bit sneaky. I'm like 98% sure my brain is hibernating right now. I can not thoughts. Thinking is no. Uh. Three coats, artificial light, no top coat. NOOOO TOPPPP COAAAAT.